We recently began selling our cases for the BeagleBone Black, and they’ve been flying off the shelves like hotcakes. Encouraged by this demand, we’ve decided to provide some insight into the case’s design, and some examples of how its features might be best leveraged. The BB100 may look like just another little case for your BeagleBone Black, but we promise that its potential for greatness makes it so much more than that. As you can see through the progression of pictures, there are three different sets of holes up the side of the case, allowing for different mounting positions based on intended usage. 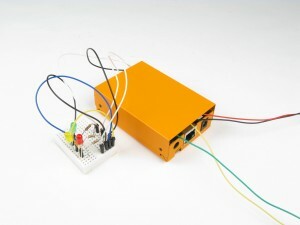 The lowest-profile configuration gives the user an attractive, fully enclosed housing for their BeagleBone while still allowing wires to be brought out. This is accomplished through the use of a com port, intended to be used as a standard sized connector interface. It’s easy to wire up a jumper to DB9 connector as seen in the picture below and make a very convenient set of matching custom connectors for a specific project. * More simply, the COM port can be used to run a number of wires out of the case. There’s another knockout feature opposite the COM port, sized to allow for the use of a button as shown. 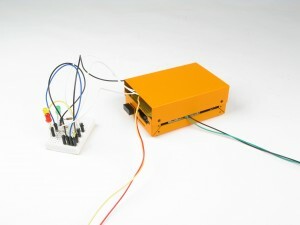 Adding a button like the one pictured allows the device to be powered on and off without having to open the case, or to perform any other function that can be dreamed up. As with the COM port, this hole can also be used to simply run wires out of the case. Now, to take things up a notch, we’re literally going to move the lid of the chassis up to the middle position. In this configuration the P8 and P9 headers are somewhat accessible (low-profile components and connectors only, really) and there’s lots of space to run wires in and out of the enclosure. Additionally, capes that are slim in profile can be used, though with somewhat limited accessibility. This ‘setting’ is somewhat of a compromise between low profile and functionality, and offers a little bit of both worlds. The highest configuration is for those who are really putting their BeagleBone to work. A large number of wires can be run out the ends, and even out the sides if necessary! Capes with a footprint identical to that of the BeagleBone Black will fit inside the case, and can be accessed from the sides. Additionally, some standard through mount connectors could be used with a prototyping cape to greatly increase the Beaglebone’s I/O. The potential to double the number of connectors on the board is there. If you took that sentence as a challenge, you’ll probably spend most of your time with the case set up this way. Beyond the dynamic sizing provided by the case design, there are a few more tricks up the BB100’s sleeve. Want to see what your board is up to? LED slots let you look in and see how it’s doing. Want to drop in a prototyping cape with a large component hanging off the end or need some space for a connector of your choice? Break the small notched section over the COM port off with a pair of pliers and go for it. What about mounting you ask? Well, twist out the small break-outs on the bottom and hang it up (be careful not to damage your board when inserting screw heads while hanging). 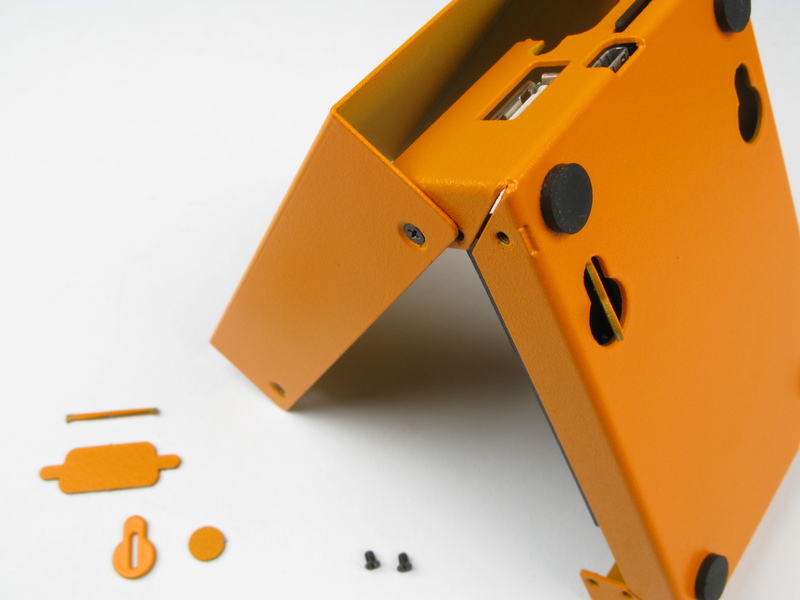 The case can also be opened and closed in a hinged manner by leaving two screws in while the lid is in the medium or high positions, making it essentially a two-screw case. That’s more like it! The BB100 is available on our site, along with all sorts of other goodies to play with. 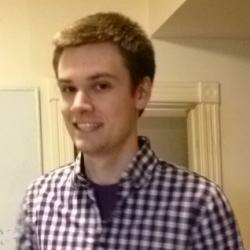 Solid models and associated files for the case in a variety of formats can be found on github. *NOTE: Don’t use the DB9 connector to connect to the UART pins (serial port) or the serial debug pins without using a serial port driver. A standard serial port uses voltage levels that are incompatible with the 3.3V levels on the BeagleBone so you’ll kill the board. **NOTE: Don’t try to use a cape in this case configuration, it will almost certainly contact the lid and ruin all your fun. love the box I plan on getting one very soon, I would also be interested in one that had-clearance for one Cape and perhaps some breakout elements on top for LEDs and buttons. Beat I’m not the only one, just a thought. By the way I’ve searched the web with no success to find the wires with the elbow jumpers you’ve used on your internal example picture. Do you make those, what are they called? Thanks for the feedback Jay! Rest assured that as we continue to develop capes for the BBB we’re remaining conscious of the space they require and a larger case is something we’ve been thinking about too. It may not be an immediate thing, but I would say it’s probably something we’ll be considering after testing the waters with the BB100. As for the jumpers, they’re actually nothing special, and can be found here. The ends are easily bent by hand or with pliers, giving you something more ‘low profile’ like you see in the picture(s).